New year, new trends. Web design is a fast-moving landscape and every year brings new conventions to keep up with. Now that responsive design and parallax scrolling are firmly embedded in the browser-based zeitgeist, what can we expect to see in the year ahead? Large images on the homepage are already a firmly established convention, but 2017 will up the stakes. Stock photography is fast becoming less of an option, as brands seeking to differentiate themselves hire photographers to create authentic, original imagery that expresses their message with purpose, rather than simply filling the screen. Video versions of the standard ‘large image’ homepage will proliferate, as moving images become further entrenched as the primary visual language of the internet. As businesses spend more money on creating their own imagery, they’ll want to put the fruits of their efforts up front and centre. To see what we mean, check out this website we recently completed for Thai street food chain Thaikuhn. Just as stock photography is on the wane, custom fonts are where it’s at. Rich typography has taken pride of place in the wider design community, and the web is no different. As the imagery has gotten bolder, the fonts have had to match, becoming as much part of the imagery as the image itself. Think of the homepage as the opener of a glossy magazine article. Web-safe fonts will always need to be specified, but as users of older browsers have become diminishingly few, the imperative to cater for them has shrunk as a result. Time to get deep into ligatures and creative with kerning. When HTML5 was introduced – doing away with cumbersome Flash – it was almost inevitable that animation would become more commonplace. Designers have started using animation to better communicate to users how they should e.g. navigate the site, without the need for language. Moving images have the power to demonstrate that still pictures can’t always replicate. Expect to see more use of subtle animations; yes to make the website more dynamic, but more for practical purposes. Users have gotten fed up with living on rails. They want to feel in control of their experience. Broadly speaking, website navigation has been pretty linear right from the start. It’s served a purpose: it makes websites simpler to use, and it allows brands to take users down a set conversion funnel, following a carefully crafted narrative. But it’s time to give power back to the users. Partially, this is because infinite scrolling has made the linear navigation form impractical, but it also represents an opportunity to enhance the website experience. Hidden navigation got a lot of attention in 2016 – where relevant menus appear at particular points of the scroll, disappearing when irrelevant – alongside parallax. See how the ‘book a table’ widget appears on the Chaophraya site when you scroll down to it, or you can click the link in the header. Two routes to the same place give a greater sense of agency. This kind of contextual, free rein navigation is likely to hit boiling point this year. Websites are increasingly constructed of micro-mini interactions. Users are getting used to, and as such beginning to demand, far more interactive online experiences. Just as they want to be untethered from the tracks of linear navigation, they also want to interact with the site. Microinteractions was the trend of 2015, but now they have mini-interactions inside them. Think about connecting with someone on LinkedIn (microinteraction) and how you press ‘connect’ on their profile to do it (mini-interaction). Small interactions like this make the user feel more involved, as the internet inexorably moves away from the passive reading experience it began as. Interstitial anxiety happens in that period of time between clicking on something and the expected event occurring. You might worry that the next page won’t open up. That the site has gone down, or your internet connection. It goes without saying that the less your site causes anxiety, the better the user experience is. Designers are starting to reduce it in creative ways. This is another aspect of the infinite scroll and parallax navigation – there’s less need to click as the page is already loaded, features already in the cache simply appear as and when they’re needed. Symmetrical composition is so 2016. Just as designers are beginning to embrace more organic textures, they’re also attracted to more organic layouts. Asymmetric composition – where elements aren’t evenly balanced between the left and right sides of the screen – will flourish in 2017; alongside asymmetric’s even more haphazard cousin, open composition. Open composition is where elements hang loosely on a page, without the usual defining lines and boxes. It’s a more abstract approach to web design, but one that tallies well with the hands-on touchscreen interfacing we’re more than used to by now. 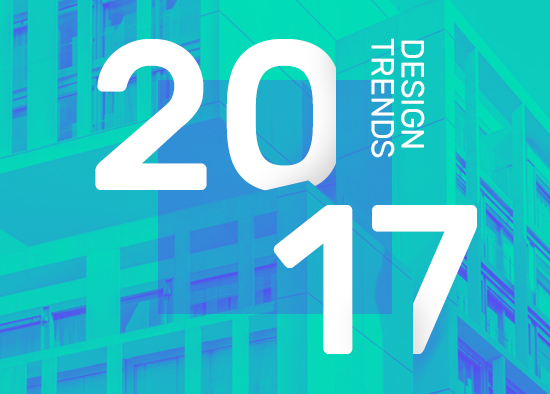 2017 will be a big year for web design. It’s the year we finally unshackle ourselves from many of the constraints of old technology to make more creative designs and a more active user experience.